This is Part 2 in a series on course & syllabus design; Part 1 is here. I last taught “Religions in America” in the fall of 2009 as a special topics course in history, which meant I didn’t have to jump through any approval hoops. Since that time, I’ve put the course through our university and General Education governance so it could be listed with a course number in the regular catalog. Now that I’m planning to teach it again in 2012-2013, it’s time to revisit the course from the inside out and update its learning outcomes and course expectations (and give it a revamped web presence). All of this can be done without altering its catalog description or governance approvals–which is an important point if you are inheriting an existing course and are looking to redesign it or reinvent its pedagogy. My 2009 syllabus enumerated course objectives (old-style, professor-centered). The objectives of this course are to introduce you to a variety of religious perspectives, peoples and denominations in America’s past and present. At the end of the course you will be familiar with a wider range of religions found in our community and nation. The course also introduces basic principles of interfaith dialogue, a skill you will undoubtedly put to practical use in your life. 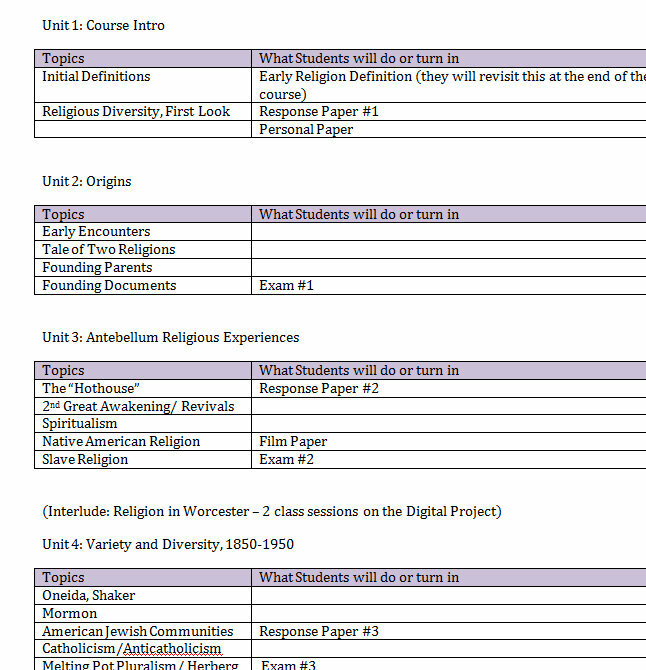 We will explore how religion informed events and ideas in American history, through focused case studies. Last night I sat down and took a first stab at new ones. This process can get messy and I am playing with different verbs to start with, I’ll refine them later. First of all, I want them to learn some American religious history, including gaining some sense of what kinds of unique primary sources exist for the study of religion in America. Draft outcome: Explain the development of America’s distinctive religious landscape over time, by recalling and connecting key events, people, legal frameworks, and concepts in American religious history. Then, I have a project in mind modeled on Diana Eck’s religious pluralism project, involving a field visit to a congregation and adding something to an existing local history database. Draft outcome: Document/ Map your understanding of Worcester’s religious communities by contributing to a religious pluralism project. I’m not sure about this one, because the learning outcome isn’t clear. But let’s leave it there for now. I also want them to be able to extract theological content from a film or other cultural text. 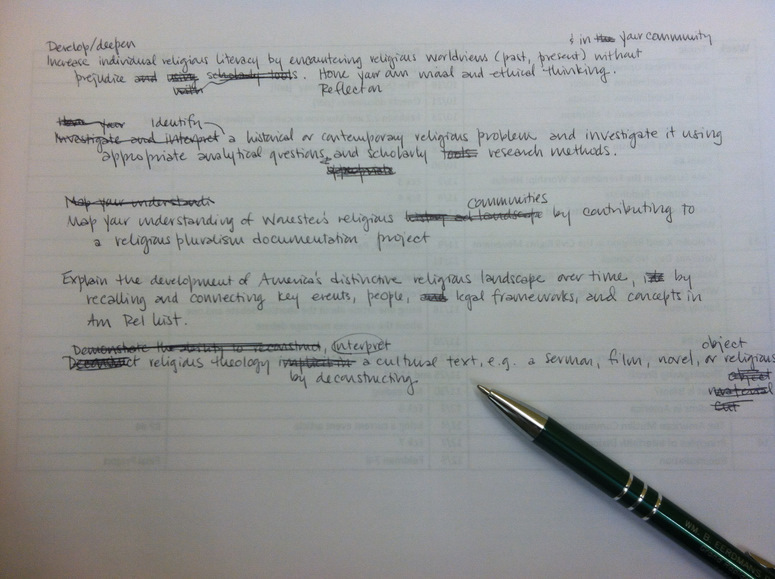 Draft outcome: Demonstrate the ability to interpret religious theology in cultural texts, e.g. a sermon, novel, film, object, sacred text or religious space. If I could identify something I want them to carry forward beyond the end of the course, an “enduring understanding” or core learning outcome, it is to be able to recognize religiosity and have an expansive definition of it. Draft outcome: Craft/ Develop a working definition (framework) of religion robust enough to encompass what you will encounter in this course and in your world; recognize and [verb needed, not appreciate but something like it] religiosity. I also want something about improving religious literacy and becoming more appreciative/respectful of others’ religions. This is hard to measure, so the wording is tricky. It, too, is something I hope will be enduring beyond the end of the course. Draft outcome: Develop/ deepen/ increase individual religious literacy by encountering religious worldviews (past, present & in your community) without prejudice. Hone/ Reflect on your own moral and ethical thinking. I had a sixth one, because they will write a research paper. Draft outcome: Identify a historical or contemporary religious problem and investigate it using appropriate analytical questions and scholarly research methods. But I feel like this one is problematic and needs improvement. It’s not really phrased as a learning outcome but a set of instructions. What will they learn by doing this? Maybe I’ll just drop it out, because the paper is probably going to end up being a means to one of the previous outcomes, rather than an end in itself. Now here’s how to go from your outcomes to a course design. Outcomes need to relate to specific activities and learning experiences. Each one should suggest a measurable artifact or assessment (I HATE those words, they sound so ed-jargony – sorry) by which your students will be able to gauge their learning and by which you’ll know if they’re learning what you want them to learn. For each outcome you should be able to answer, “how will I know they can do this?” and the answer becomes the nugget of a course unit or a major assignment, and when you have a handful of those you can use them to design the structure of your course. Which of them make sense to appear earlier in the course? Which lend themselves to the later end of the course when you may want students to be synthesizing, presenting, or demonstrating competence? Which connect to each other in a natural flow? I usually put this in the form of a table; makes it easier to see (that first column should say “Course Learning Outcomes”). Once I have a clear THING for each outcome, I can slot those into a skeletal framework for the course, and begin to create units or clusters or however you like to think of a course’s internal divisions. Here’s a snippet of that in progress. Now I’ve got a behind-the-scenes document for myself, a primitive proto-course. From here a good next step is to decide on readings and what we’d do in class during each unit. My version of this course is an upper-level seminar, not an intro-level lecture course. I could explore options like group collaboration, film screenings, lots of class discussion, workshops on primary source analysis, or peer review sessions for the research paper, since the classes at our university are capped at 32 which keeps them pretty manageable in size and scope. Thanks for this, Tona. This is really generous of you to show us how you construct a syllabus. It’s helped me think more carefully about how I’m writing mine. I echo David; this is tremendous. Thanks.